Naive Facial Cleansing Foam is safe for your skin since it's made of 100% natural cleansing ingredients. 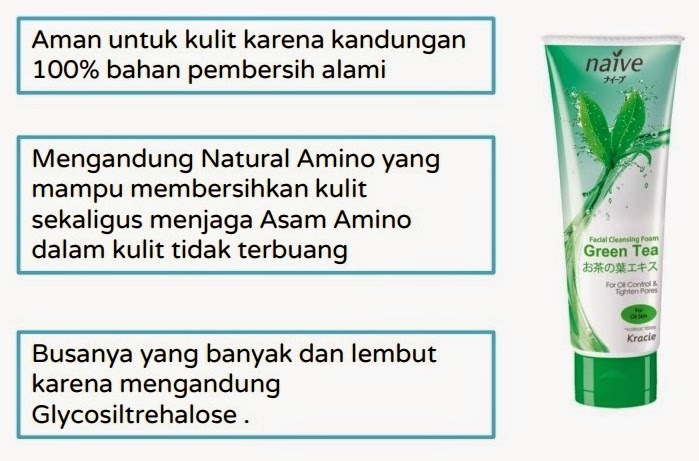 Contains Natural Amino which is able to clean your face while keeping the amino acid in your skin. The soft and smooth foam contains Glycosiltrehalose. Cleanse dirt and dead skin cells from your skin, with green tea leafs extract which helps to control excess sebum/oil and minimize the pores, plus natural amino to maintain the skin's moisture naturally and keep your skin from dryness. To use: squeeze out 1-2cm of Naive Facial Cleansing Foam. Foam with enough water and spread onto your face and neck, massage gently. Rinse with water. Naive Facial Cleansing Foam cleanse dirt and dead skin cells on your face and maintains amino acid in your skin to keep your skin moisturized, soft, and healthy. Amino acid is removed alongside the dirt, making the skin dry. Amino acid is maintained in the skin, keeping the skin moist. 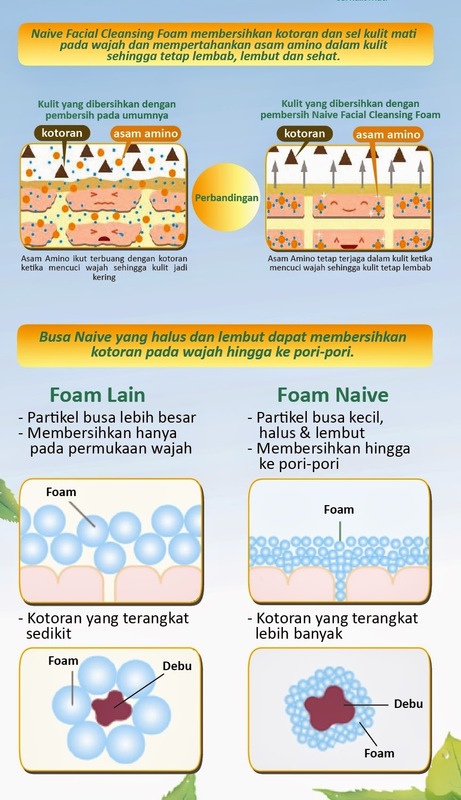 Naive Facial Cleansing Foam's soft and smooth foam is able to cleanse the dirt on your face even down to the pores. 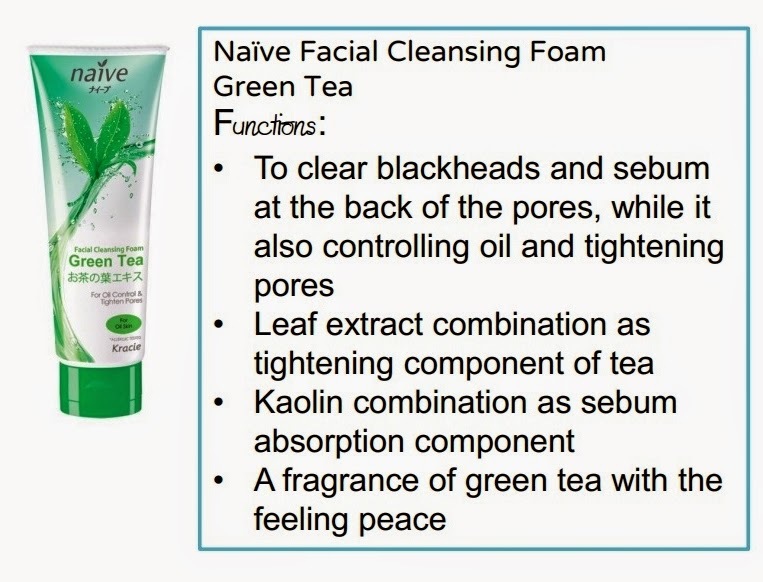 Naive Facial Cleansing Foam has this tea-like scent which is very refreshing and another good thing is that it has Colorant-free formula, explains the white color, right? 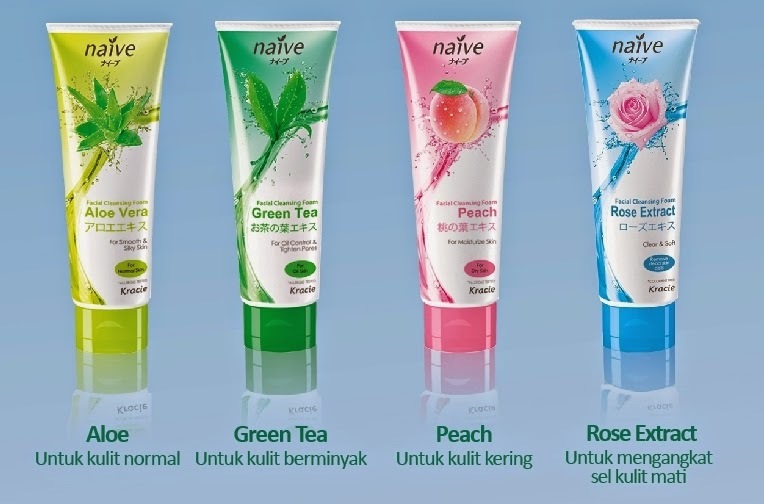 Naive Facial Cleansing Foam is quite thick with cream consistency. And it produces a lot of foam! On my face, it feels really smooth and refreshing with a nice cooling effect. 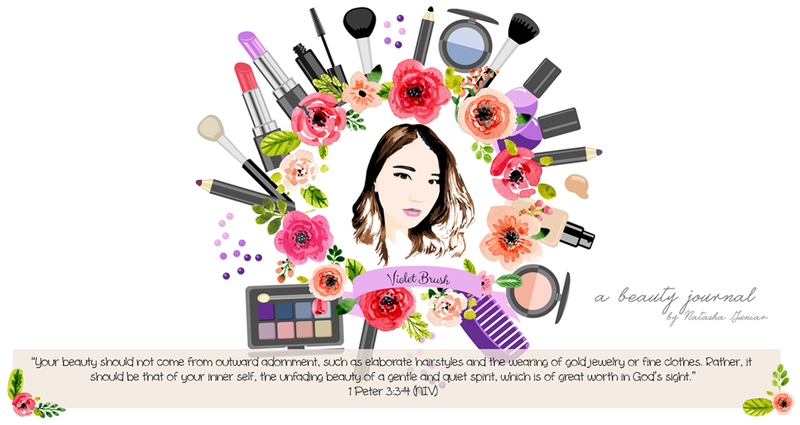 My skin feels like velvety-smooth (or in Indonesian, we call is keset) after usage but not dry. It didn't leave any dry patches on my skin. To top that, it controls the sebum on my T-zone pretty well. However, one big minus point is this product is a little bit comedogenic on my skin. I had never had this much of blackheads ever since (sorry, no photo ><) and it has no effect on my pores although I don't have much problems with my pores. But other than that, I think Naive Facial Cleansing Foam is a good product compared to another product on the same price range. I'm contemplating for it's a little bit comedogenic on my skin. This looks and sounds really good! I would love to try the peach or rose one! wah syg juga ya agak komedogenik ..
padahal lainnya udah oke ..
iyaa, itu doang sih kekurangan nya tp jd bahan pertimbangan yg lmyn jg hehe thank you!